1. Junior Assistant - 7 posts; Salary – Scale of Pay Rs.5200-20,200/- plus Grade Pay Rs.2400/- in PB 1; Educational Qualification - 1) A Bachelor Degree for 10 + 2 + 3 years system of education. 2) “Certificate course in computer on office Automation” awarded by the Directorate of Technical Education. 2. Typist - 3 posts; Salary – Scale of Pay Rs.5200-20,200/- plus Grade Pay Rs.2400/- in PB 1; Educational Qualification - 1. Minimum General Educational qualification. Preference will be given to degree holders. (c) Typewriting English Higher and Typewriting Tamil Lower. Explanation: Item (b) will be recruited if item (a) is not available and item (c) will be recruited if item (a) and (b) are not available. 2. “Certificate course in Computer on Office Automation” awarded by the Directorate of Technical Education. 3. Steno-Typist Gr.III - 3 posts; Salary – Scale of pay Rs.5200-20,200/- plus Grade Pay Rs.2800/- in PB 1; Educational Qualification - 1. Minimum General Educational qualification. Preference will be given to degree holders. (c) Typewriting English and Tamil Higher and Short hand English Higher and Tamil Lower. Explanation: Item (b) will be recruited if item (a) is not available and item(c) will be recruited if item (a) and (b) are not available. 6. Farm Manager - 1 Post; Salary – Scale of Pay Rs. 9300-34800/- plus Grade pay Rs.4400/- in PB 2; Educational Qualification - B.F.Sc., degree with Overall Grade Point Average of 3.00 / 4.00 or 7.00 / 10.00 or its equivalent is essential. (d) Must have a thorough knowledge of all electrical appliances with special reference to motor testing, battery repairing, armature winding, attending to the installations like electric motors giving connections to motors and starters etc. Explanation - Preference will be given to persons holding certificates in electrical engineering issued by private institutes like Chengalvaraya Nayakar’s Technical Institute, Madras and Government I.T.I. (b) Practical experience in a workshop or a factory for a period of not less than 3 years and experience in repairs and maintenance of tractors, pump units and agricultural machinery. (d) Experience in Office works such as entry of tapals, stitching of bills, Despatch of Tapals and other Office works. Candidate’s Age Limit Should not exceed SCA, SC / ST- 35; MBC / DC, BCM, BC-32 and OC-30. 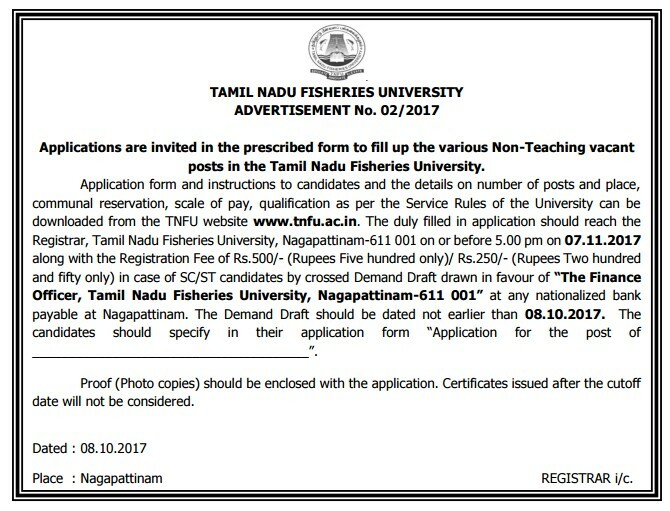 on or before 5.00 pm on 07.11.2017 along with the Registration Fee of Rs.500/- (Rupees Five hundred only)/ Rs.250/- (Rupees Two hundred and fifty only) in case of SC/ST candidates by crossed Demand Draft drawn in favour of “The Finance Officer, Tamil Nadu Fisheries University, Nagapattinam-611 001” at any nationalized bank payable at Nagapattinam. The Demand Draft should be dated not earlier than 08.10.2017. The candidates should specify in theirapplication form “Application for the post of ________”. Proof (Photo copies) should be enclosed with the application.